Both modern (left) and stone (right) markers grace this mile location which is sandwiched between housing developments found across US 1 from Laurel Lakes Shopping Center. Dating back to the 19th century, there had been a significant hotel near here, worthy of its own stop on the B&O. Various sources have named it as the Oak Rest Hotel, or Oak Crest Hotel or Red Oak Inn. Perhaps it changed names over the years. The hotel stood near the present-day intersection of Cypress Street and Waggaman Avenue. The B&O Station was where Cypress Street now dead-ends at the railroad. Does anyone have additional information or pictures? 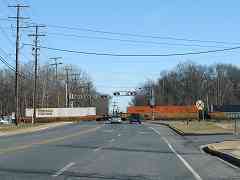 From Elkridge south to DC, US 1 remains on the west side of the Washington Branch tracks. However before about 1920, this was not true. 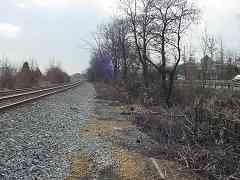 Here at Contee, the road had crossed to the east side of the tracks (i.e. behind the photographer) where it remained until crossing back at Beltsville. 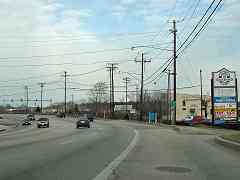 The road in the distance, which is now named Contee Place, had been part of that Baltimore Washington Turnpike. 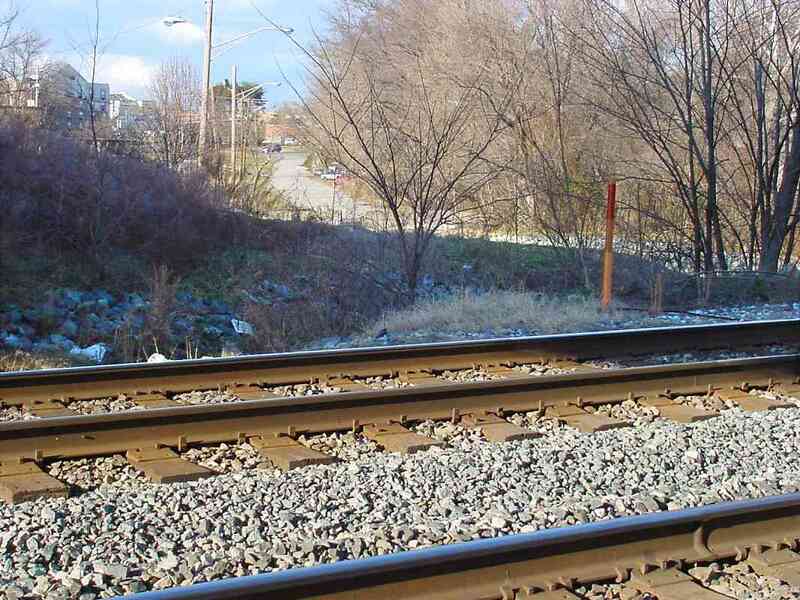 It had crossed the tracks at the location of this photo. 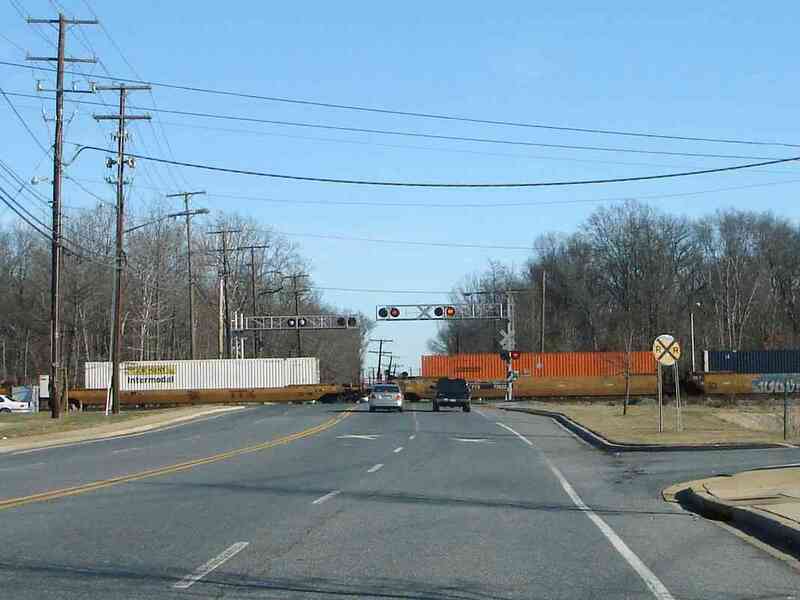 Rising auto traffic levels no doubt encouraged the redesign of US 1 to eliminate this grade crossing as well as that in Beltsville (seen later in the tour). 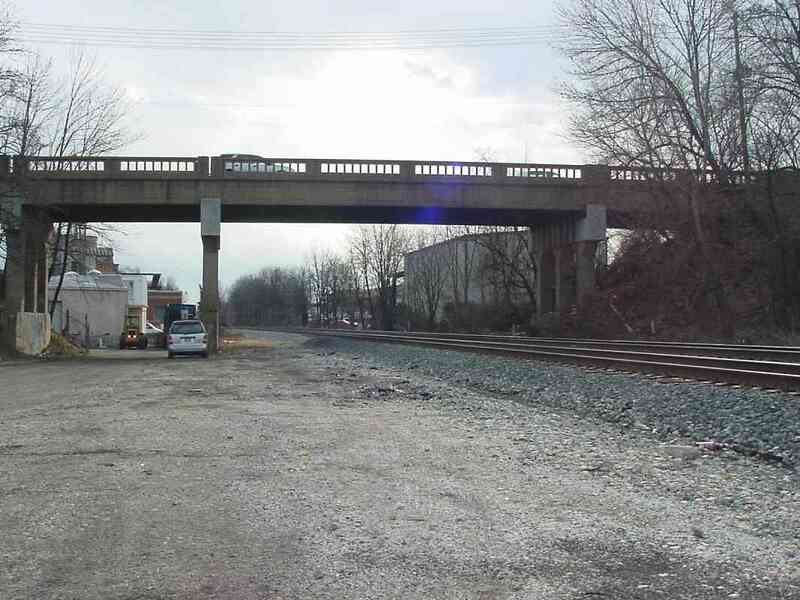 The Contee Road bridge is one of the newest overpasses to be constructed on the Washington Branch. 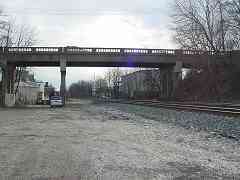 In 1997 it eliminated the grade crossing that had been here. 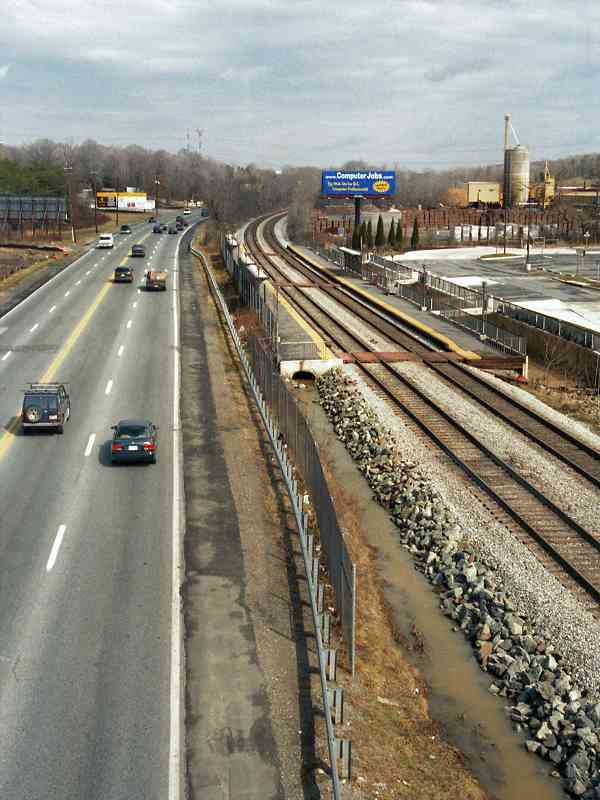 The pavement in the foreground is the crumbling remains of the Baltimore Washington Turnpike's original alignment. 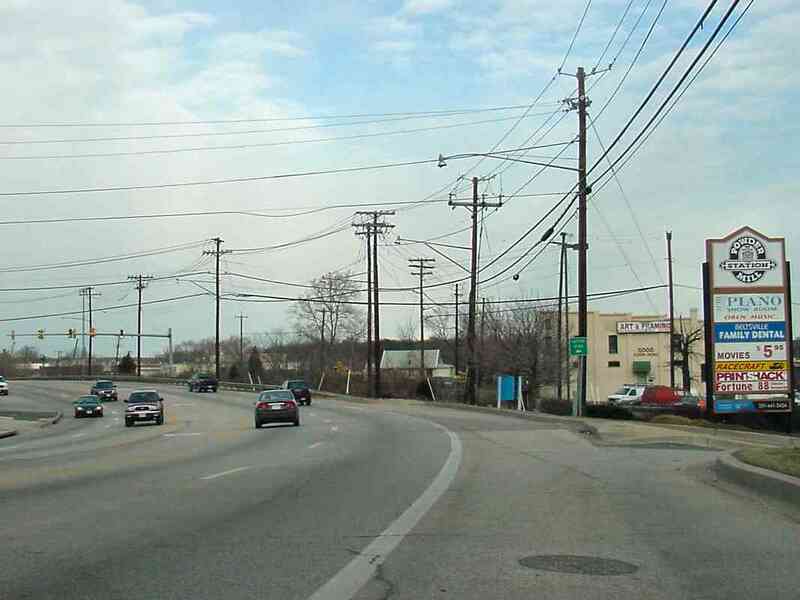 Parts of that alignment survive today and remain in use as Old Baltimore Pike. The lights of CSX 5853 glint off the rails as it lazily rolls some work equipment westbound through Muirkirk Station on Track 1. 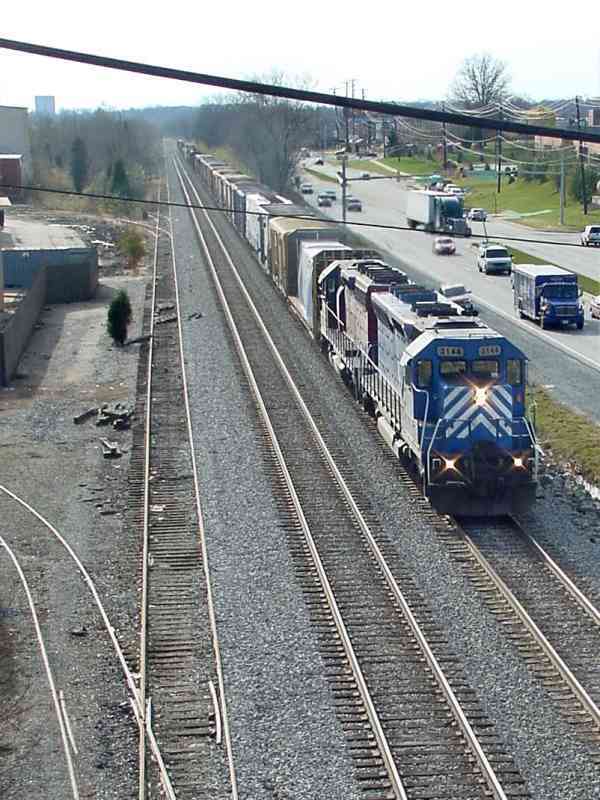 The hopper on the end still carried a C&O reporting mark (might have been C&O 918329). This is the view north from the 1970-dated Muirkirk Road overpass. 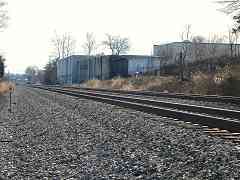 On the right is the Muirkirk MARC commuter station, site of the photo above, and on the left is US 1. There is a very similar photo (circa 1920) on page 155 in Impossible Challenge II that's fun to compare. 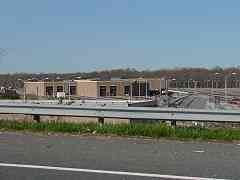 The Inter County Connector, MD 200, will connect to US 1 near here. 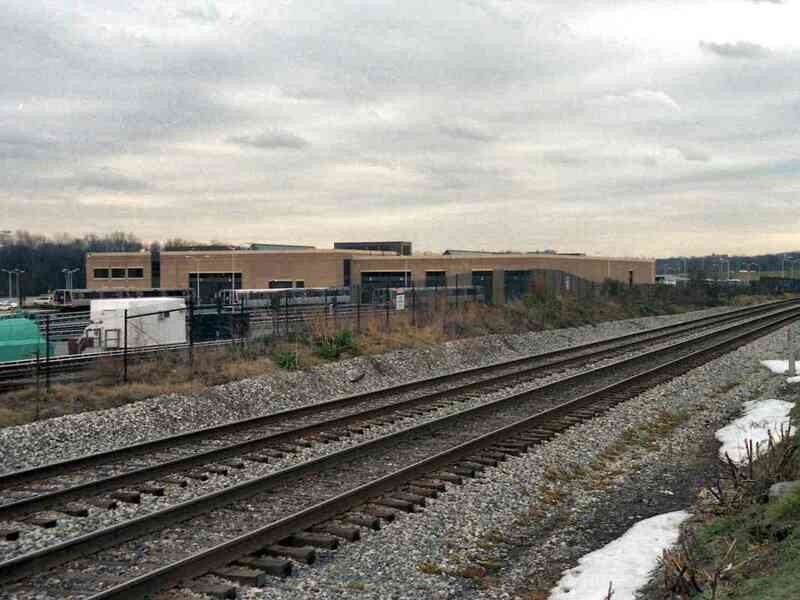 About 2 miles west the ICC connects through the planned Konterra development, which is being promoted by none other than decendants of 19th century railroad baron Jay Gould. Almost two minutes later, the sluggish work train has not only passed the entire station but also the siding off Track 2 for the Muirkirk Industrial Park. 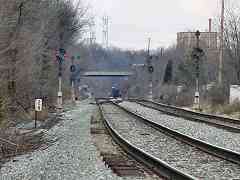 Eventually the train may reach the signals at Dale, about a half mile distant. 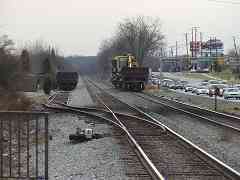 That's US 1 on the right, from which the photo linked below of the old grade crossing was snapped. Here's the view from above as two leased units lug an almost mile long mixed freight; CEFX 3144 is in the lead wearing a "Bluebird" paint scheme. 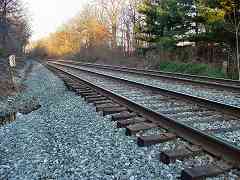 I think the track is straight for a longer distance here than anywhere on the Old Main Line! Not pictured: From this vantage spot on the Muirkirk Road overpass, you can look down and to the left to find an original B&O stone milepost (number 25). Looking northeast once again, this is the view from the now disused Ammendale Road grade crossing. 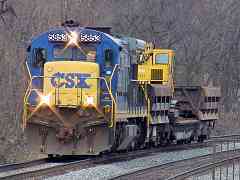 Since the time of this photo CSX replaced the CPL-style signals at this interlocking. Same spot as the prior photo, just looking in the opposite direction. There are not as many interesting things this way. It's almost not worth calling your attention to the tiny bit of concrete at the bottom of the photo, a relic of the disused Ammendale Road grade crossing. "Ammen was a US Navy Admiral, boyhood friend of U.S. Grant who saved Grants life from drowning as a boy. After the Civil War he retired to an estate which he named Ammendale. Grant considered him his only true lifelong friend and during Grants troubled presidency, Grant and Family often spent time at Ammendale to escape the pressures of Washington. Ammens daughter was in the first graduating class of Notre Dame Institute, now Notre Dame College, and the Grant and Ammen families attended the graduation and are listed in the program though I do not know if they traveled to Baltimore by rail, the history department of the college should have the answer. Great website." 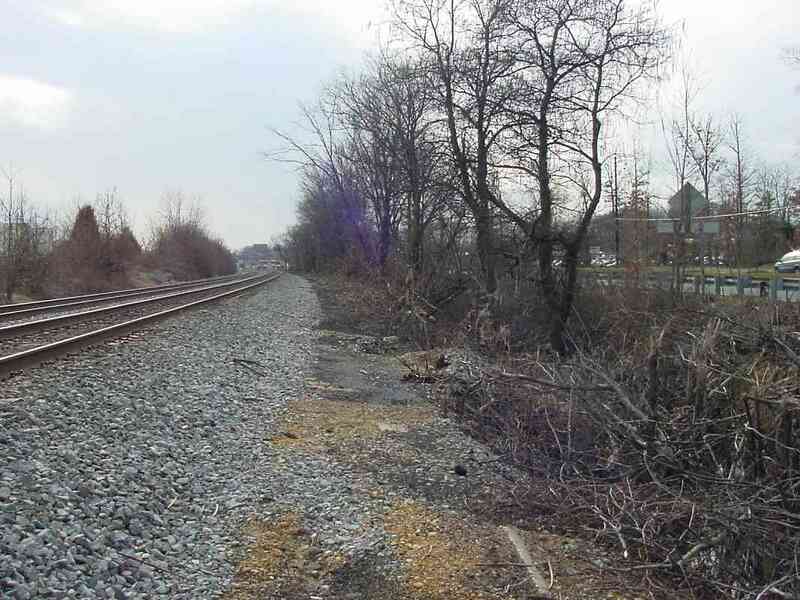 At the center of this photo which looks northeast from shortly north of the Powder Mill Road intersection is another disused grade crossing. Instead of curving left, US 1 had continued straight to cross the tracks then ran between the small house near the center, and the tan building at right center. As at Contee, the increasing level of automobile traffic instigated the re-routing of US 1 sometime around 1920. 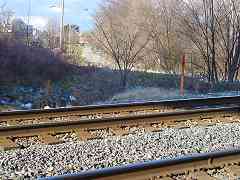 In this photo, the Washington Branch tracks are hidden by the brush; they cross left to right in front of the tan building. 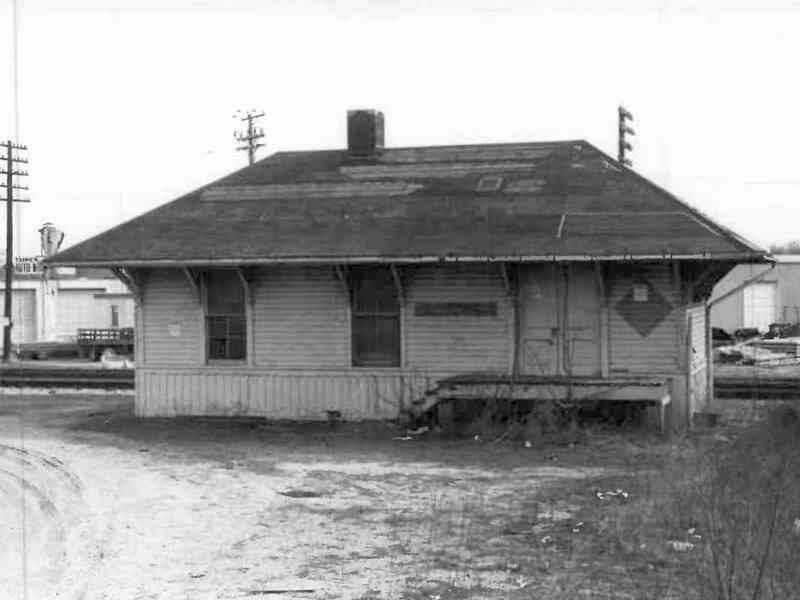 The B&O's small, frame Beltsville Station hung on into the 1970s. The Powder Mill Station shops seen in the previous photo occupy the B&O station's site. "Powder Mill" refers to nearby factories that made gunpowder during the 18th and 19th centuries. 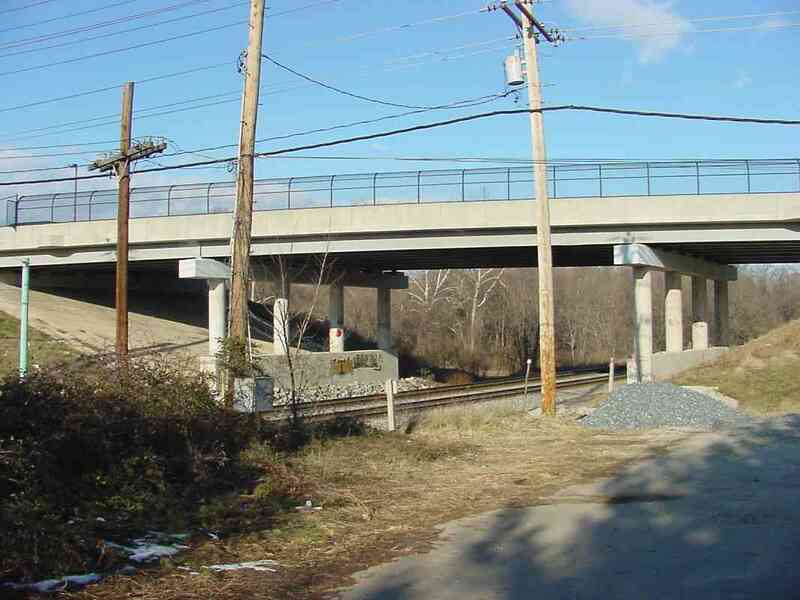 Powder Mill Road, MD 212, was one of the first roads of the Washington Branch to graduate from a grade crossing to an overpass. I was not able to find any cornerstone or marker that revealed the year of construction. 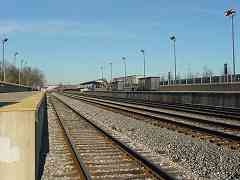 The B&O's Beltsville Station had been located on the right. 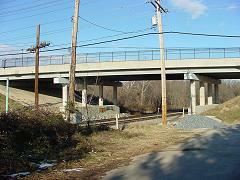 "The Beltsville/MD 212 overpass is relatively new. I believe it dates to about 1960. There's a picture on the wall of the Town Center theatre that dates the overpass (it is a picture of the Sidney Lust's drive in, on the parcel just S. of the bridge, but shows the bridge quite well, description mentions it was new). "There were several grade crossing between Beltsville (now MD 212) and Contee. 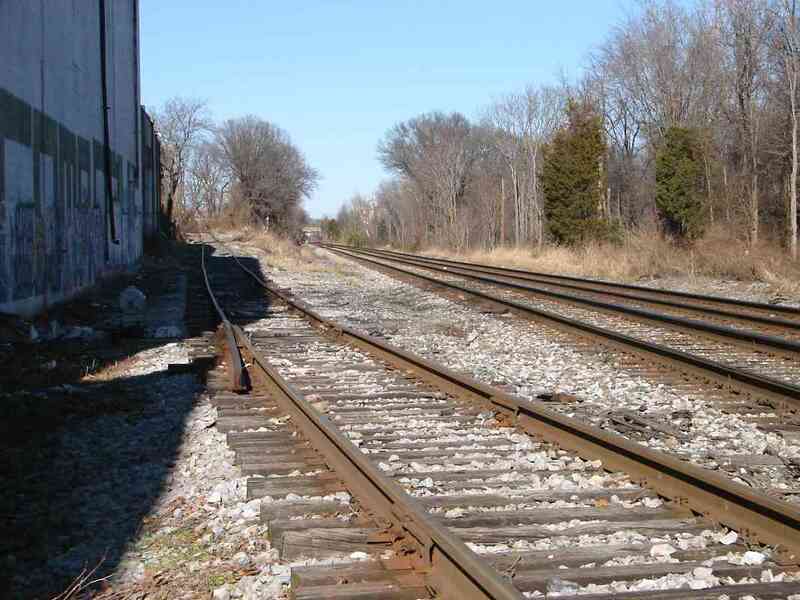 In 1967, there were grade crossings at Odell Road and Ammendale Road. Muirkirk was a single lane steel bridge over the tracks at Muirkirk Road. The Muirkirk bridge was replaced in late 1960's/early 1970's, and the Odell and Ammedale Road grade crossings were closed about that time." After landowner Trueman Belt granted the B&O this right of way through his property, the railroad named the area Beltsville. Coincidentally, some 135 years later the Capital Beltway (no relation) would also barge through on the south side. If you squint through a mile of haze you can see a distant Beltway bridge in this photo. Well, not really, but it is out there beyond this mile-long (practically a record) straightaway. On the left former residences have become part of the Beltsville Agricultural Research Center. On the right disused and still-in-use sidings serve post-WWII industry. 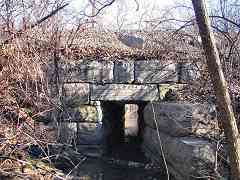 This may be one of the few Washington Branch culverts/bridges to survive in its original 1835 form. 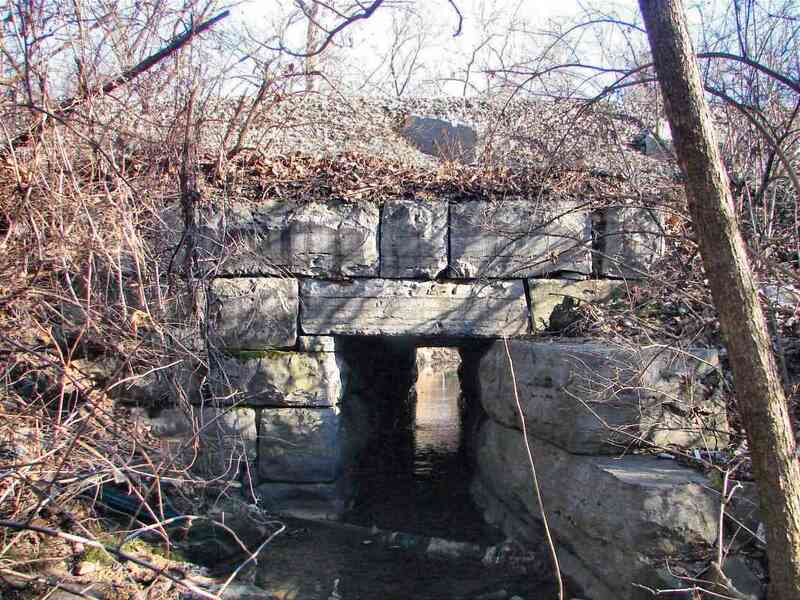 The relative lack of development along this stretch means the railroad never had reason to widen or redo this culvert that adds water to Indian Creek. Two styles of whistle post warn of the Sunnyside Avenue grade crossing ahead. The post on the right has been highlighted for viewabilty. Behind that post, note a rising ramp, one of the few active spurs remaining on the subdivision. Though the Beltsville Industrial Center served by this spur originated during the 1950s, the rails show a forging date of 1915. 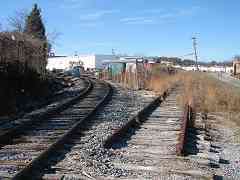 The B&O often recycled rail hardware from the mainline into spur track. At the time reuse was called frugal and cost-effective, now it's called "green". The spur does the typical splitting into sidings, many of which have been disused like this one on the right at Hanna Street. 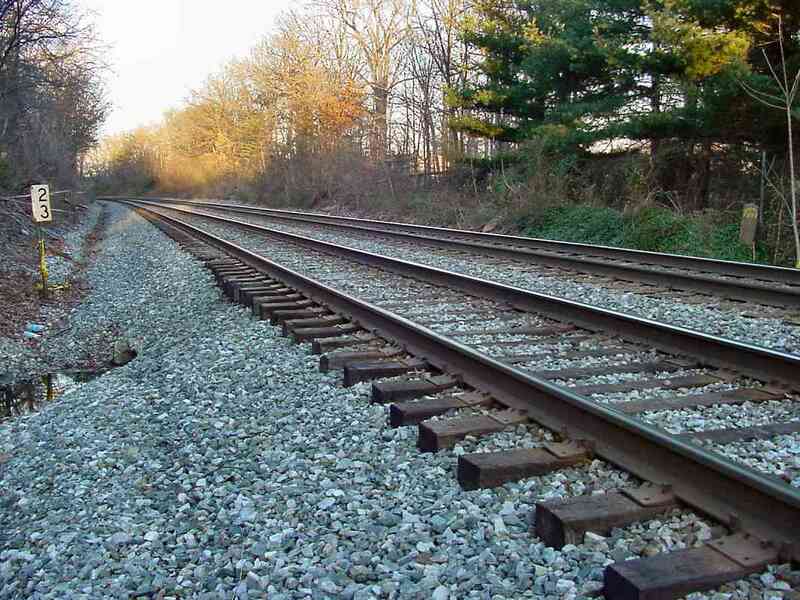 The rails on the left are not rusted over, so trains do still venture here from time to time. 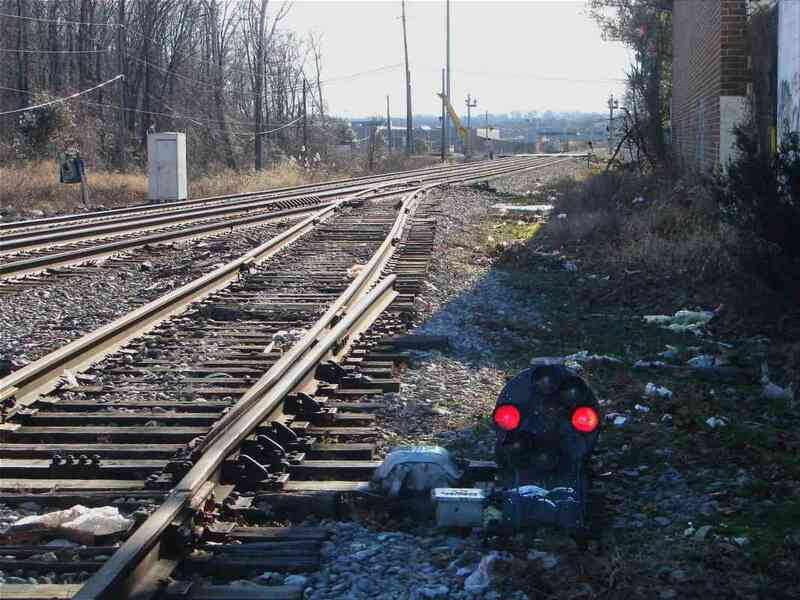 With CSX hunting CPLs to extinction, the remaining stragglers of the dwarf species of the beloved B&O signal are hiding at little-used spurs, in fact this might become the last such CPL alive on the subdivision. An original mile marker watches over the Sunnyside Ave grade crossing. Since the time of this photo it has been painted white. I've been pondering the design of these stones. When you stand edge on and observe them, you see Baltimore engraved on the left, and Washington on the right. That makes sense since the cities are in those directions. When viewed from a moving train, however, most of the time only one engraved side is in view at any given moment. 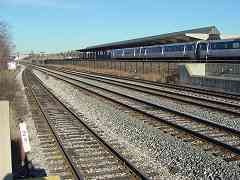 The view from a Washington-bound train is much like that in this picture. Under such circumstances, the stones are confusing. This one gives the impression that Baltimore is 28 miles ahead, whereas in reality it is 28 miles behind. Of course in 1835 the engravers did not have for reference established standards like interstate highway signs. 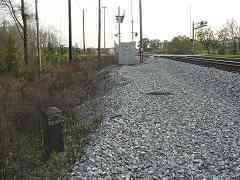 Another possibility is the railroad relocated this stone from the other side of the tracks. Murphy's Law of Railfanning: trains roll by only after you start your trip home. A B&O Station List from 1917 includes Sunnyside. If it adhered to the siting pattern of other stations on this branch, Sunnyside Station would have been located near the RR crossing road sign on the right. 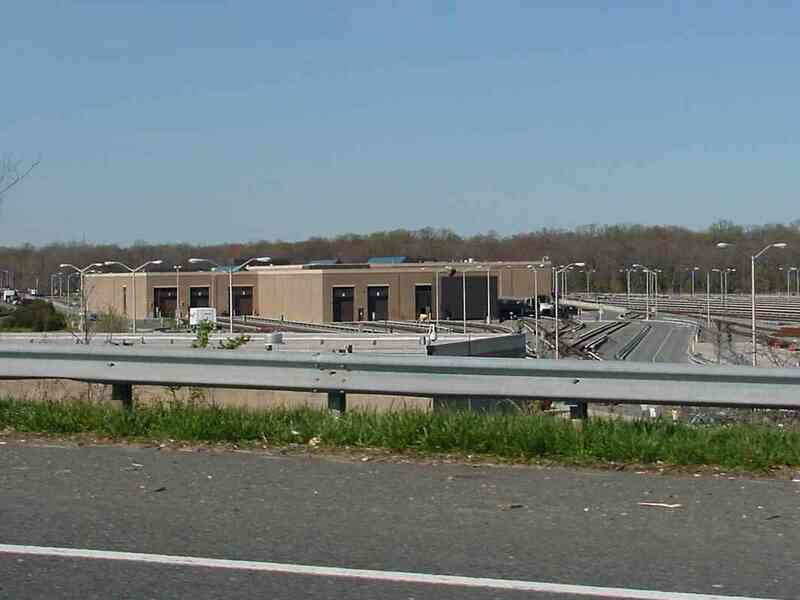 Metro's Greenbelt facility is easily seen from the outer loop of the I-495 Capital Beltway. Greenbelt is a terminus of Metro's Green Line, for the moment at least. Long-term planners have proposed extending the line northeast to Baltimore Washington International Airport some 20 miles distant. Such an extention would likely parallel the venerable B&O line at least to Laurel. "It's a MARC station." 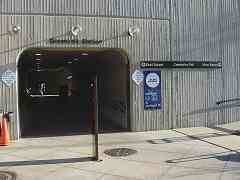 ... "It's a Metro station." ... "Wait! You're both right." At Greenbelt the trains compete not only with the cars of DC area commuters but also with each other. Still, that doesn't mean the signage is easy to understand. To go south, take the MARC train West, or you could take the DC Metro. 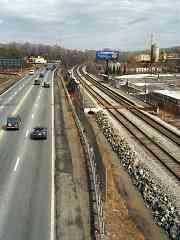 To go north, take the MARC train East, but you can't take the Metro (the line ends here). Got that? It's easier to understand when viewed from the platforms above. The north (east) end of the MARC platform is right at mile marker 29. There's no B&O stone milepost to be found here; it was likely removed as part of the station construction. We can look across to the adjacent Metro station where a Green line train is just pulling in. Since this is the end of its line, the train will sit with doors open until the next train arrives. 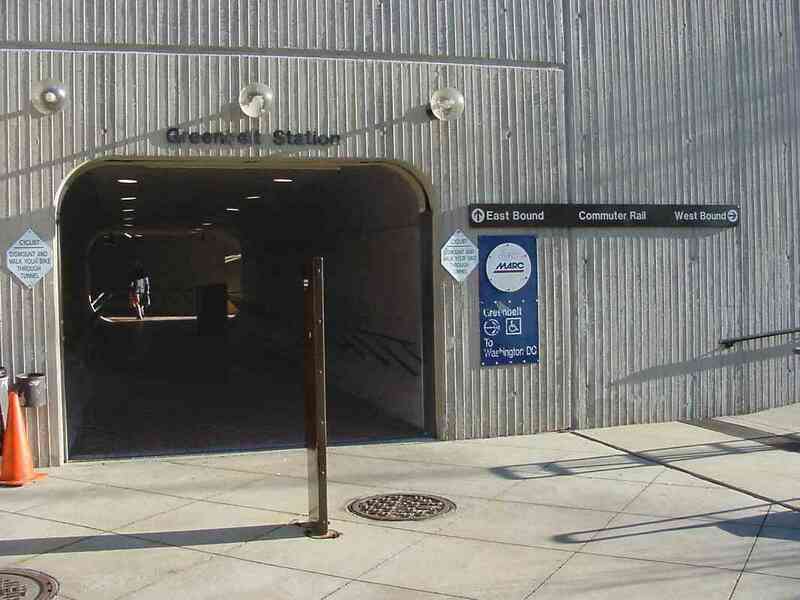 Metro's Greenbelt station opened during 1991. In the distance toward the left you'll find CPL signals, still present during 2018, and evidence of this right of way's B&O heritage. Now CSX shares the line with MARC commuter trains. 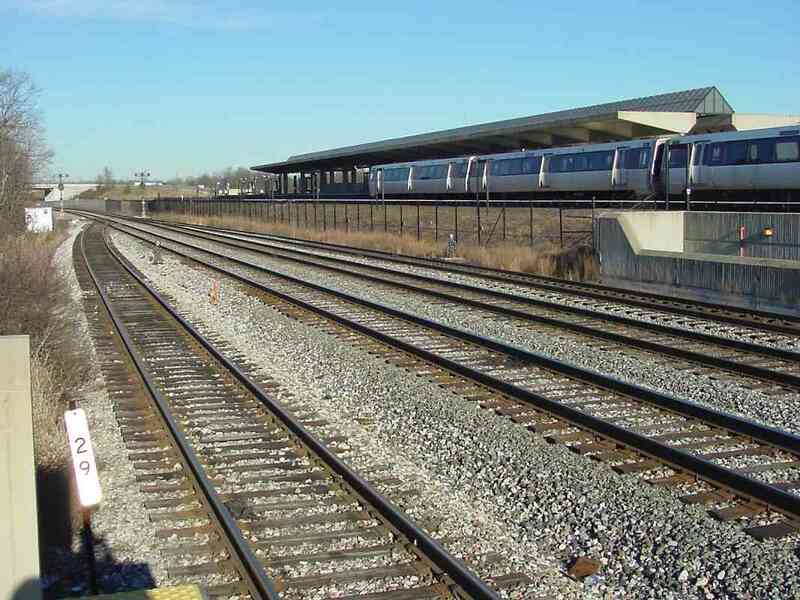 Notice how an extra set of tracks peel off the mainline (the two tracks in the center) in order to serve the station, and get MARC trains out of the way of passing freights. 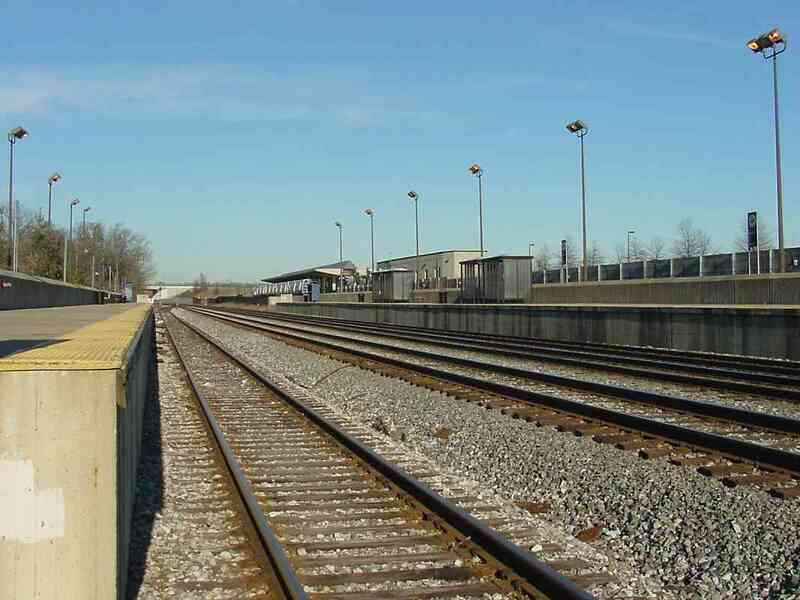 Here is much the same view as the prior photo, but from the south (west) end of the MARC platform. The Metro train is in the distance at center left.